You are here: Home / Articles / Food & Health News / Are Omega-3 Fatty Acids our Fountain of Youth? 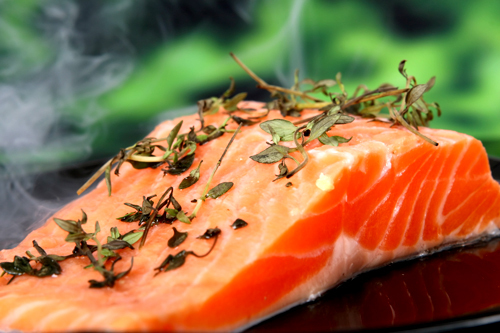 Are Omega-3 Fatty Acids our Fountain of Youth? Scientists have known for many years that omega-3 fatty acids are beneficial in treating patients with coronary heart disease by helping prevent heart attacks and sudden cardiac death due to arrhythmias. They are also essential for brain development in infants and children and help with proper immune system function. Now, a study published in the Journal of the American Medical Association reveals that increasing consumption of dietary omega-3 fatty acids may help slow biological aging (JAMA. 2010;303(3):250-257). The study looked at the effect of omega-3 fatty acids on telomere shrinkage over five years. Considered to be a biological marker of age, telomeres are structures at the end of chromosomes that become shorter the more times a cell divides – and the slower this process of shortening, the slower the process of aging. In this study, the more omega-3’s patients consumed, the slower their telomeres shrank. The conclusion? These powerful polyunsaturates can help you stay healthier longer and decrease the rate of cellular aging. So include fatty fish, such as wild-caught salmon, sardines, herring, mackerel and albacore tuna in your weekly diet. Good substitutes include taking a daily fish oil supplement for DHA omega-3. If you turn to plant sources, other omega-3 fats are found in nuts, seeds, seaweed and oils (flax and canola). By making sure these polyunsaturates are a key part of your diet, you can reap the benefits of the fabled fountain of youth: prolonged good health.